This past week, as US Congress quacked its way through the debt-ceiling quagmire, a seemingly non-germane offshore issue surfaced vis-a-vis Iraq. The connection between the two was anything but inconsequential, despite receiving scant review in Washington. If one wonders how US debts and US wars could be so integrally related, one needs to look no further than the latest report by the Special Inspector General for Iraq Reconstruction (SIGIR). On 30 July, the inspector general reported out on the status, success and sustainability of US reconstruction efforts by defence and state department missions operating in Iraq. It turns out that the effort there has not been successful or sustainable, citing that “Iraq remains an extraordinarily dangerous place.” What they found, however, may please fiscal conservatives who, now more then ever, queue to cut every piece of low-hanging federally-funded fruit they can find. Take a look at SIGIR’s findings: there is fat for the trimming. One US government contractor, Anham, is making millions off the Iraq war, allegedly charging US taxpayers $4,500 for a circuit breaker that costs only $183 at an appliance store, $3,000 for a separate circuit breaker that costs $94, and $900 for a control switch that costs $7. The contractor has issued a statement denying the charges of overbilling; the issue, in any case, is not limited to one contractor. DynCorp was also fingered by SIGIR for inflating claims for the construction of container camps. Thankfully, SIGIR is reclaiming $7.7m from the company and another $1m from its subcontractor, the Sandi Group. That defence contractors are making a killing out of the war in Iraq (or for that matter, Afghanistan, Libya, Pakistan, Somalia, Yemen, etc) is hardly news. The Wartime Contracting Commission, the Government Accountability Office and the Inspectors General have illuminated as much on numerous occasions. What is perhaps most appalling — and what this report highlights — is that corruption runs deep within our military ranks. This may perplex those who see the Pentagon as operating according to purely patriotic imperatives and as incorruptible. The Pentagon’s own are not only culpable of complicity in war profiteering, but as SIGIR identified in a closed-door briefing for congressional staffers last week, but are themselves incriminated in some cases. The Pentagon, we were told, has dragged its feet in pursuing cases of outright corruption, but ultimately this works in justice’s favour – by forcing SIGIR to send its cases to federal court, instead of military tribunals. Consider the recent roster of criminal cases. 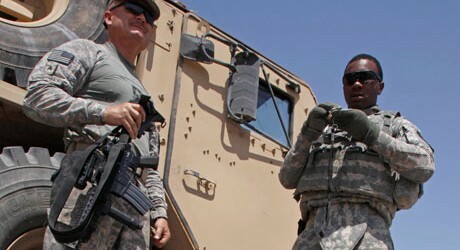 In June this year, a US Army sergeant was indicted for taking more than $170,000 in bribes from defence contractors and laundering up to $250,000 through bank accounts in Kuwait and the US. The same month, a former US Army major pleaded guilty to bribery, funnelling $250,000 to an account in Los Angeles. In May, a former US Army major was found guilty of money-laundering, after admitting to the receipt of four wire transfers — at $100,000 each — and the creation of a sham agreement with contractors to conceal the payments. The list is long, but deserves three more mentions. A US Marine Corps contractor officer helped money-launder approximately $150,000 in bribes from contractors in Iraq. Another US Army sergeant, while serving in Iraq, stole generators designated for electricity-starved Iraqis, making over $44,000 from the scheme. Finally, a US Marine Corps Major – while stationed at Camp Fallujah – illegally solicited and received gratuities on a $2.2m contract that he was tasked with inspecting and monitoring. There are many more stories like this, and there will continue to be more, as long as 47,000 US troops and 62,000 defence contractors (only 5,000 of whom are Iraqis) remain in Iraq. As the US government reviews the status of forces agreement and considers extending its stay, it must also consider extending the mandate of SIGIR, which is due to expire next year. Keep in mind that SIGIR has to date recovered $154m in fines, forfeitures, payments and other penalties. Beyond mandate extensions, and for the sake of all things “debt reduction”, we must consider a permanent special inspector general for overseas contingency operations, so that our oversight of misspent federal funds is not so short-term, near-sighted and ad hoc. Because US military corruption in Iraq is not an anomaly; it is happening in Afghanistan and every other US intervention where oversight is lacking. With $3.7tn already spent by the US on the wars in Iraq and Afghanistan, it is painfully apparent that this money is not being spent wisely; in some cases, it is simply being stolen. As Congress prepares to consider cuts to critical social programmes, after the debt ceiling debate’s conclusion, proper oversight must not be obstructed under the pretext of protecting our national security apparatus. Too many millions of hard-earned US taxpayer dollars are being pocketed by war profiteers posing as our protectors. This practice must stop. Now.